There is nothing more heart warming then seeing your child’s eyes light up. I don’t believe in spoiling my children with material things so when they do get things whether it’s a gift or not I really love that they appreciate it so very much. I like to think that’s half due to our parenting tactics and half due to them being good kids. 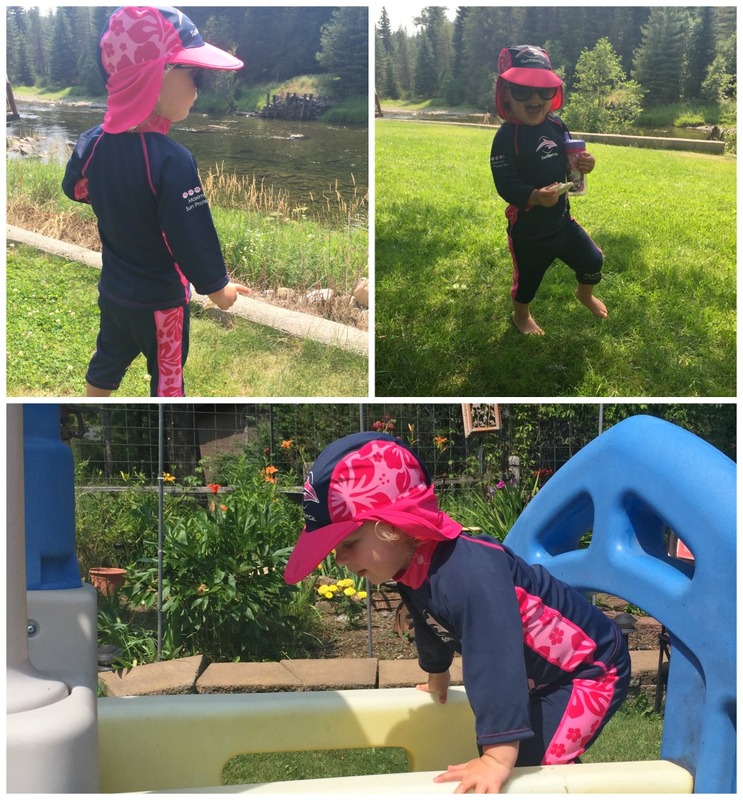 As swimologist for Konfidence this year, we were sent these amazing UV protection hats, shirts, and shorts for both my toddlers. I saved them for our US trip knowing how extremely hot it gets at my parents house. This summer couldn’t be any hotter than I have seen in a long time here with temperatures over 100 degrees fahrenheit day after day. My two toddlers are both blondies so I try to protect them as much as I can from the sun but still let them run and be free in it. From the moment I pulled these outfits out of our suitcase, B has been obsessed with them. Lately, he has a new obsession with clothes, hats and new things to wear. I think we might have the next Alexander McQueen on our hands with his love for clothes. He pulled his UV protection hat on right away and wore it while eating his breakfast. I couldn’t stop laughing. “Mommy, I love my new hat, thank you for giving me it”. He looks so grown up sat there eating his shreddies with his swim hat on chatting away to his sister. I felt proud that he has manners, proud that he shows his appreciation, and proud that he is such a great big brother to MM. It’s one of those moments you remember long afterwards and take a snapshot in your head of that moment as simple as it was. 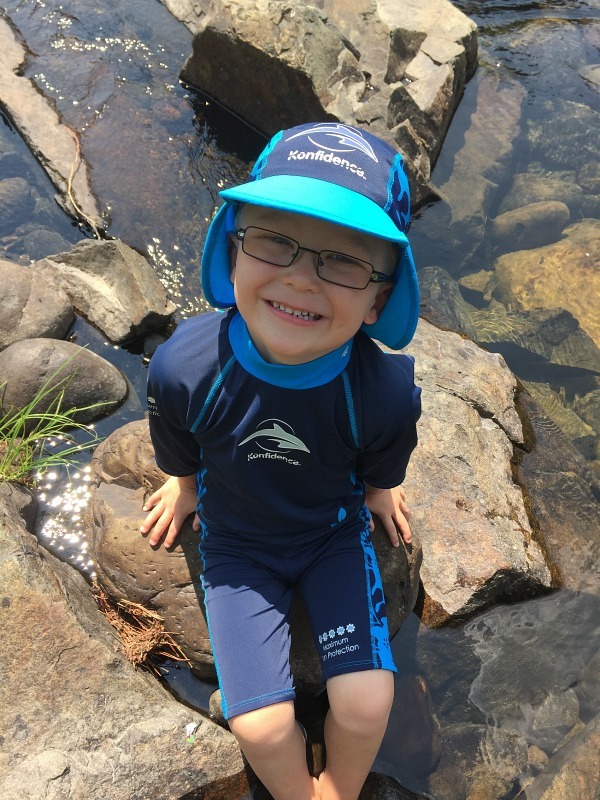 My parents live on the river but also have a medium size paddling pool for the kids to play in so there is lots of fun in the water each summer here. There isn’t a day that goes by that we aren’t outside swimming and jumping in the water which means we go through a lot of sun block. The kids definitely seem happier here to roam and be free in the sun. Not that they aren’t happy back in the UK but two toddlers are easier to handle with fresh air and space to run wild. I hope they remember our amazing summers each year at Grandma and Papa’s house. I love our chilled out days where we live life at a slow pace in the mountains. It has been just as refreshing for me as it has been for them. As a friend always says, the ordinary moments sometimes are the most memorable, she couldn’t be more right. B couldn’t wait to put on his UV protection shorts and shirt. 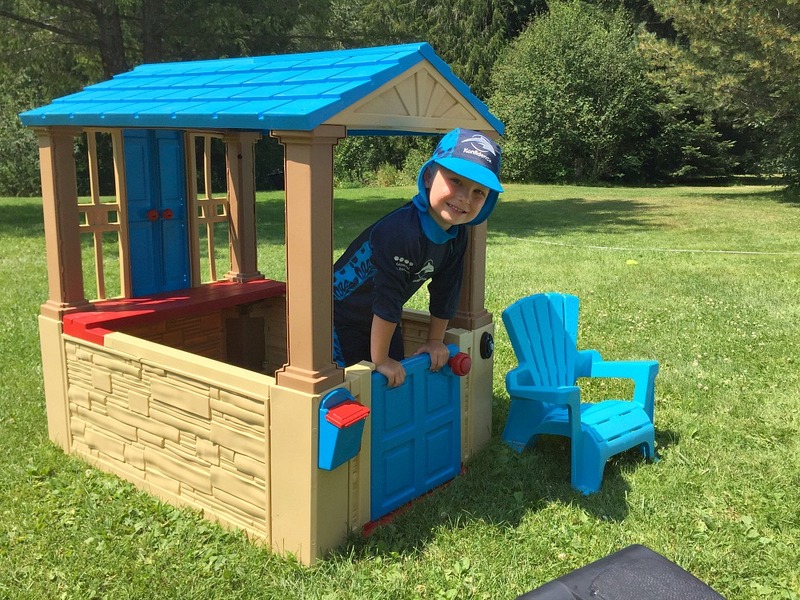 He didn’t waste any time jumping in his pool, walking down to the river and playing in his playhouse. I was so surprised how cool it kept him and how much coverage it was for him. Anything to use less sun block on my kids makes me happy as the chemicals always make me nervous on their skin. This way I don’t have to worry about it washing off and reapplying. With the temperatures getting hotter, and hotter here I am so grateful we have these with us for the summer. They dry so fast and are really lightweight so the kids don’t feel weighed down. MM doesn’t get excited as much as her brother about new clothes or new anything really but it only takes her a second to see her brother with something and she wants it too. She has become his little twin lately and it’s adorable to see her trying to be just like him in every way. I never thought she would wear her UV protection hat but B talked her into it. Recently, I have been using B as my parental assistant and when I can’t get MM to do something I have him talk to her, tell her, or ask her to do it. It’s amazing how influential a sibling can be. When MM won’t eat her vegetables all B has to do is get a spoon and say I will feed you MM and she eats it all. I know, let’s call it new age parenting tactics. He didn’t have to ask her twice to wear her cool new hat as you can see from her smiles she was loving her new protective outfit too. Sun, sun and more sun has become our ordinary day here in the states. We wake up and don’t have to check the weather and immediately get ready to go outside after breakfast and we only come in to eat and the kids naps then head back outside. I have really seen the difference in the kids attitudes and behaviors too. I feel better for it in so many ways. I cherish this time with my family and being back home with my kids where they can get to know my culture. It’s bittersweet that they are now making memories where I made my own childhood memories. I always get a little emotional when I see my kids doing something exactly as I did in that very same spot. That’s the beauty of coming home for the summer with them. 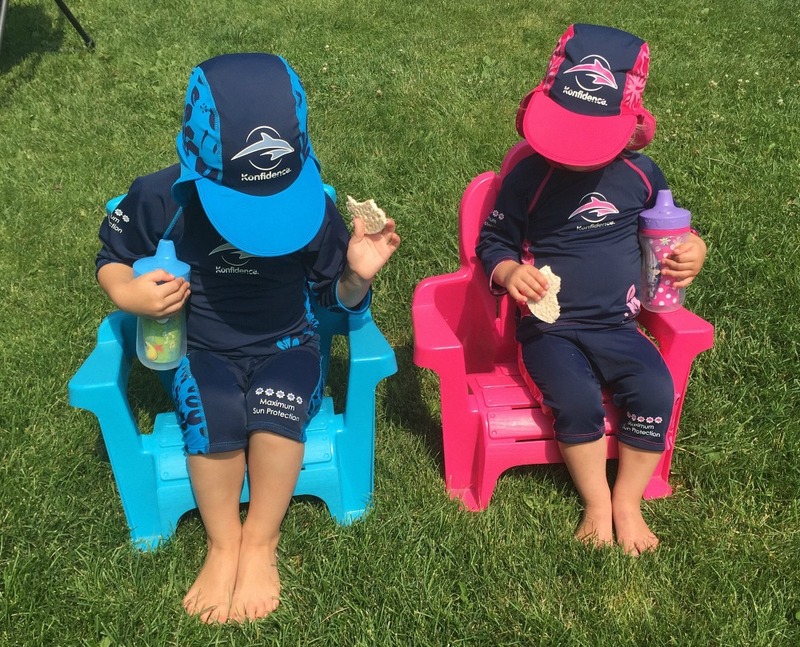 We have a busy next few weeks in the sun and I am relieved we have these amazing UV protection swimwear from Konfidence to help keep my tots safe from the sun. 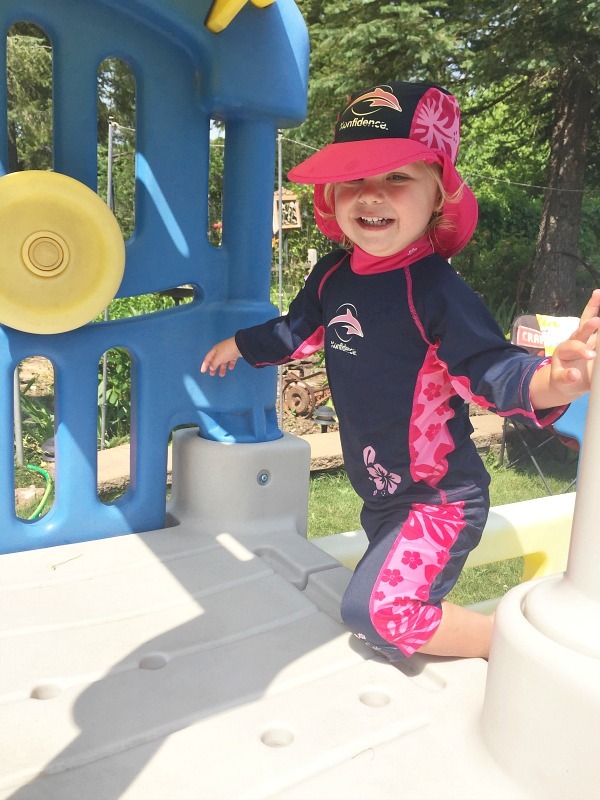 It’s perfect for playing out in the yard, on the river, in the pool, at the beach and all the places we are getting to this summer in the sun. They couldn’t have been more happier with their matching outfits and I couldn’t be either. The key to a great summer is to protect them from the heat and the sun, no one wants a ratting child that has had too much sun or even worse a sun burn. We have only been here three weeks now but the kids have grown up so much in that time. Before I had kids I never realized just how fast it would go. This summer has been an eye opener for me as I was getting overwhelmed with being so very busy back in the UK before we came and living a slow pace life really showed me what is the most important thing in life…family. I am taking things slow here in the states and surrounding myself with my kids and extended family as much as I possibly can until the end of August. I love our ordinary days chilling outside together and listening to my two toddlers chat about big issues such as the choo-choo trains that go by the house. Oh, how innocent they really are at this age. 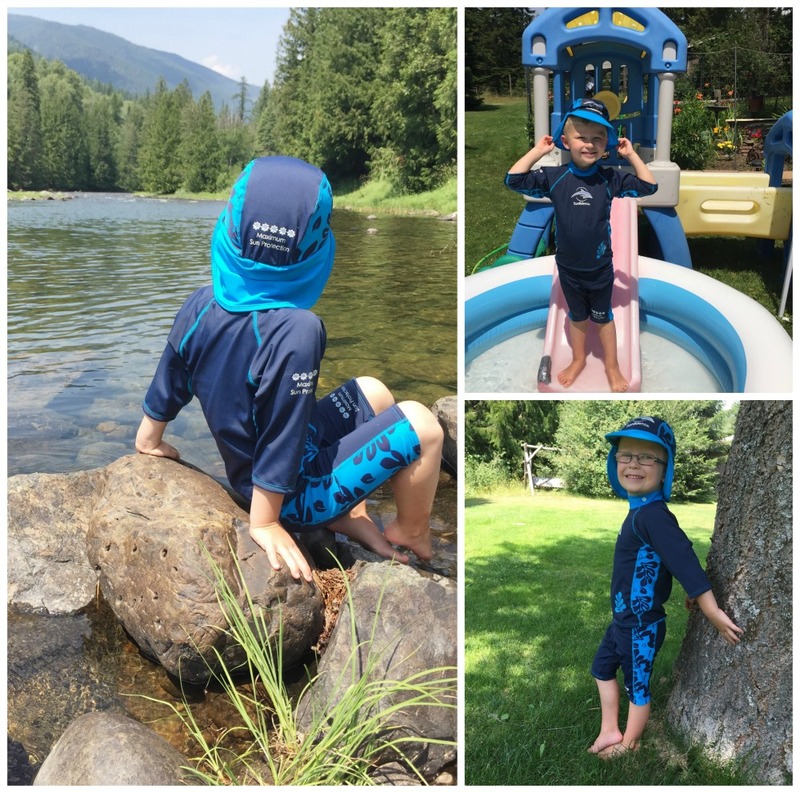 * We are 2015 Family Swimologists for Konfidence and have been sent these amazing products for the purpose of review and testing. However, all photos and opinions are our own. Oh yes the kids are loving the outdoors and all the water fun. 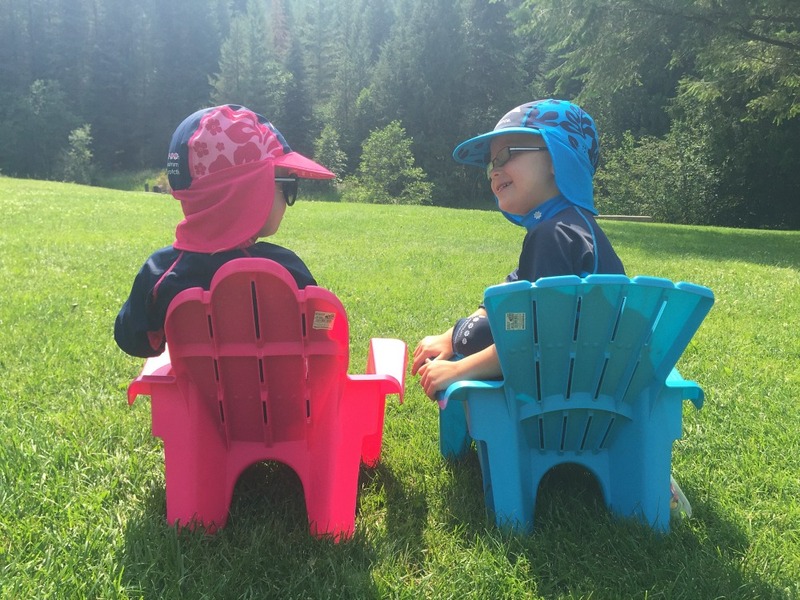 I love these summers and making great memories with my kids as my own mother did with us. I hope we always get to come here. Oh how lovely for you all to have that space to run free, I know what you mean about it not quite being the same at home. And hurrah for uv suits that mean less sunblock, especially in those temperatures, I think I’d just have to sit in the river until it got cool again!! We do that a lot Carie. The river is a savor having it right next to the house when the temperatures just get too hot we jump in to cool off. The uv suits are amazing I haven’t seen it this hot for so long for many years. The kids are still loving it though. It sounds like you are having an amazing time. What a beautiful place to live! Yes we really are making the most of our summer here Laura thank you so much. It’s a stunning place in the country for sure. I am so grateful for it to be my home. Oh no has the weather turned there… I thought it was nice. Boo I know how it is summers there can be tough. How exciting for florida. Oh yes the heat is strong in the south so I would definitely check them out it’s worth every penny to keep the kids protected. Enjoy your trip and relaxing summer, there really isn;t anything better than being with family as they really are the most important thing. Oh I couldn’t agree more and it makes it even more special when you don’t get a lot of time with family so you really make the most of it while we are here in the summers. Thank you Aby it truly is heaven here in the country and I am so grateful to call it home and share it with my kids. We are living it up outside as much as possible. We are huge konfidence fans. Thank you Natalie. It’s even more beautiful in person. Pictures don’t do it justice at all. If you could believe that. Love that my kids love the water as much as their momma and not hate it like my husband’s entire family. They look adorable in their matching outfits! How lovely to get back to the US for the summer, I am sure they will make many, many lovely memories. They really look like little twinsies in these but it’s protecting them and they think they are so cool in them its hilarious. It’ been a great summer so far. Thank you.